Prime Minister Atal Behari Vajpayee today said a chief ministers’ conference would soon be called to take up the issue of delegating more administrative and financial powers to mayors in the country. The 89th session of the Indian Science Congress, the most prestigious meet of scientists from all over the country and abroad, will unfold at Lucknow University, here, tomorrow. Preparations are in full swing on the Lucknow University campus for the Indian Science Congress, beginning in Lucknow on Thursday. A special CBI court today extended the judicial remand of former Bihar Chief Ministers Laloo Prasad Yadav and Jagannath Mishra for another 14 days in a conspiracy angle case of the multi-crore fodder scam. The Bhopal police has cracked a complicated cyber crime involving a threat to blow up the Madhya Pradesh Chief Minister’s residence and the state secretariat. The police has traced the Internet cafe from where the e-mail was sent and has taken into custody four youths for questioning. The Tehri Dam issue is likely to cast a shadow in the coming State Legislative Assembly elections in the Garhwal division particularly in three constituencies of Tehri Garhwal and two of the Dehra Dun districts. There is simmering discontent amongst the dam-affected people against the ruling BJP. The ongoing parleys between the BJP and the Nationalist Congress Party (NCP) for an electoral alliance in Manipur for the next month Assembly elections are aimed not only at forging a winning combination but also to send a political message to its ally, the Shiv Sena. The efforts of the lesser-known parties to put up a strong fight before the ruling BJP and the main Opposition Congress in the first elections to the state Legislative Assembly in Uttaranchal scheduled for February 14, this year have for the time being failed to deliver. Two city postmen were hospitalised after they felt discomfort on handling a “suspicious” green powder from a packet which also contained Osama bin Laden’s photograph on the eve of New Year here. Film star-turned-politician Sunil Dutt, Delhi Minorities Commission Chairman Zafar Ali Naqvi and Dr J.K. Jain of Jain TV are among the celebrities selected for the prestigious Maulana Mohd. 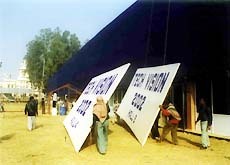 Ali Jauhar Awards, 2001. The awards will be presented by Jamia Millia Islamia Vice-Chancellor Shahid Mehdi at a function here on Friday. The Lover's Organisation for Voluntary Exhibition (LOVE) in Kolkata urges the state government to mark free lover's zones. Slum children in Mumbai look forward to an educated future, as an NGO focuses on their special needs. The Rajasthan police in association with various women NGO's starts the state's first Women Counseling and Security Centre (WCSC). “If required, the government could also hold a meeting of the National Development Council (NDC) to build a consensus for devolving more administrative and financial powers to the urban local bodies which had gained importance in the present process of urbanisation,” Mr Vajpayee said while inaugurating the two-day 37th All-India Mayors Conference here. The Prime Minister said he was in favour of granting more powers to mayors to enable them to carry out the process of urban development and a chief ministers’ meeting would soon be called for the purpose. He stressed the need for delegating more powers to the local bodies, indirectly blaming the state governments for ignoring their genuine rights. 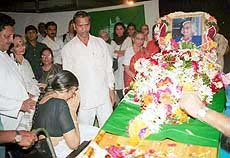 Mr Vajpayee stressed the need for uniformity in the election process of mayors. At present, mayors are elected directly in some states, while it is an indirect poll process in other parts. The inaugural function, delayed by over three hours as the Prime Minister was behind schedule due to fog, was a brief one, with only Mr Vajpayee speaking on the occasion. Union Urban Development Minister Anant Kumar, UP Governor Vishnu Kant Shastri, Chief Minister Rajnath Singh and other dignitaries were present at the function. Mr Vajpayee objected to being addressed as the chief guest for Lucknow was his home and he was the “host” to the conference. Calling upon mayors to make the functioning of the local bodies more effective, he said the population boom made it difficult to provide basic amenities to the masses. Earlier, a charter of memorandum was given to the Prime Minister by All-India Council of Mayors Chairman and Indore Mayor Kailash Vijayvargiya, urging for intervention by the Centre in empowering urban local bodies in the country. Welcoming the guests, Mr Vijayvargiya said it was for the first time that a Prime Minister had inaugurated the mayors’ conference. He lamented that the mayors, who were called the “first citizen of the city”, did not enjoy any powers. He also called for bringing uniformity in the tenure and process of electing mayors in the country. The congress, will be inaugurated by Prime Minister Atal Behari Vajpayee. The mood is euphoric not only on the campus but also in the entire city as the Prime Minister is the Member of Parliament from the city. Various buildings of the university, a sample of rich Mughal architecture, have been given a new look for the inaugural session. The delegates have started reaching the venue. The main pandal where the Prime Minister will address the gathering has been erected and other arrangements are being given final touches. With the sun appearing today after many days of foggy conditions, the decks have been cleared for the visit of the PM in his constituency. The scientists will address some crucial areas of science, technology and engineering related to the focal theme of health care, education and information technology. Addressing mediapersons about the programme here today, the General President of the Science Congress and Vice-Chancellor of CSJM University, Kanpur, Dr Sarvagya S. Katiyar, said a programme was drawn after taking into consideration the fact that the world scenario was undergoing a rapid change and issues of globalisation were impacting on all disciplines of science and technology. He said that the motive was to link education with various sources in relation to development of society. Despite advancements in chemotherapy and other treatment modalities, human disease continued to consume lives and erode economy. It was with the efforts of scientists all over the world that there had been a revolution in medical and biological sciences and information technology, he said. Keeping in view these challenges, said Dr Katiyar, the Indian Science Congress would make a comprehensive review of the national scenario and make recommendations for developing effective treatment and preventive strategies with special reference to our country. The programme would also include seven plenary sessions, four evening lectures, besides 22 sessions of special lectures to be organised simultaneously in 22 halls of the university. The court of designated CBI judge P.R. Das extended their judicial remand in RC68 (a) of the fodder scam in which Laloo and Mishra were remanded to judicial custody on December 20 and December 24 respectively. The case RC68 (a) is related to withdrawals of over Rs 37 crore through fake and forged allotment letters from Jharkhand’s Chaibasa treasury. Laloo, who is currently lodged at Beur jail in Patna in connection with RC63 (a), did not appear in the court citing poor health. Dr Amar Singh, secretary to the Chief Minister, received an e-mail on December 29 saying that the sender, while on his way from Delhi to Bhopal, had heard some people in the train discuss a plan to blow up the Chief Minister’s residence and the state secretariat on the New Year’s Day. The secretary reported the matter to the police and the cyber cell of the CID promptly sprung into action. After finding out from where the e-mail message was sent, the cyber cell sleuths were able to trace the telephone number, which led them to one Ram Mishra of Harshavardhan locality. Mishra, who was running a computer centre in the name of Sudarshan Computers, old the police that he had leased two weeks ago his Internet connection to Shivam Computers at Mata Mandir locality. At Shivam Computers, the sleuths were able to break the password with the help of experts. It was found that between 1.30 p.m. and 2.43 p.m. on December 29 seven e-mail messages were sent from that computer. The offending message was sent during this period. It was also found that the e-mail ID used for sending the offending message was created around 1 p.m.
Based on the information provided by the owner of the Shivam Computers, the police has taken into custody four youths, two of them sons of officials working in the state secretariat. For the first time in 30-years, people have started reacting after work on the controversial 2,400 MW hydro-power project resumed on the banks of Bhagirathi, a tributary of river Ganges in the Tehri Garhwal last month. The change is attributed to the recent displacement of nearly 35,000 residents of the area taking the total to nearly 1 lakh people. The Tehri Hydro Development Corporation has already started filling the dam with water by shutting down tunnels 3 and 4 and deviating the flow of Bhagirathi river thereby submerging the old Tehri town and 28 adjoining villages. Students and businessmen of Tehri are on warpath due to this shifting. “The government will have to pay a heavy price for the unilateral action. Students have been put to a great deal of hardship,” says Mr Rajiv Nayan Bahuguna. His father, Mr Sunder Lal Bahuguna has been campaigning against commissioning the dam for the past two and half decades. He and his wife were also forced to leave their hut when water actually started pouring in. By and large, the dam oustees are also unhappy with the compensation package, which according to one of the oustees, Mr L.M. Saklani, “was not adequate”. Even where the oustees have been gradually settled over the years in some foothill areas such as Bhaniawala, Kargi Banjarawala in Bahadarabad near Rishikesh, Dehra Dun and Hardwar, problems of civic amenities continue to bother them. Successive state governments have been negligent and insensitive to the problems of the oustees and the BJP, which had made tall promises before the election has actually done very little, points out Mr Lalit Badoni, an affected oustee. It is worth mentioning that the Hanumantha Rao Committee appointed by the then Prime Minister, Mr Deve Gowda, to look into the problems of the oustees had favoured a special deal for the affected before the final commissioning of the dam but the committee report is now gathering dust. “Where is the land for all the oustees?” asks Mr Bhudev Lakhera, a former member of the coordination committee of Tehri Dam, who was at one time the chairman of Tehri Zilla Parishad. The entire rehabilitation would have to be carried out by the Uttaranchal Government. As it is, the present state government of the BJP does not seem much bothered about the pending problems of the oustees. Its candidate, Mr Lakhe Ram Joshi, had earlier won the Assembly election from Tehri constituency on account of his personal image and probably a weak opposition. Mr Bhagat Singh Koshiyari, CM of Uttaranchal, has recently inducted Mr Joshi into his Cabinet so that he attains the position to lure the voters by influence of power. And now, 10 revenue blocks in Tehri district have been delimited into five constituencies — Tehri, Pratapnagar, Ghansali, Deoprayag and Narendranagar out of which three are affected by the dam and may influence polling. These are Tehri, Pratapnagar and Narendranagar. Besides these constituencies, BJP is likely to get a tough opposition from Rishikesh and Doiwala constituencies were thousands of oustees have been rehabilitated. “The BJP is sensitive to the problems of the dam-affected persons and we will try to help them as soon as we take over the affairs of the state government,” promises Mr Suryakant Dhasmana, a senior leader of the Congress who is likely to contest the election from the Doiwala constituency. An alliance with the NCP in Manipur would also be a beginning of the future political alignments, a source said, adding that if the electoral alliance makes the desired headway in the North-East then an understanding at the Centre could not be ruled out. The issue of the NCP joining the Vajpayee government would obviously come later, but an emerging understanding with a party strong in Maharashtra would definitely reduce the muscle flexing strength of the Shiv Sena, a leader pointed out. Moreover, Shiv Sena supremo Balasaheb Thackeray has objection against Maharashtra Home Minister Bhujbal, and if he could be sidelined by the NCP then even the former would be happy if the Maharasthra leader Sharad Pawar joined the Vajpayee government. The roping in of the NCP in the political scheme of things began at a time when the Trinamool Congress led by former Railway Minister Mamata Banerjee has been pressurising Prime Minister Atal Behari Vajpayee to take her back into the Union Cabinet. NCP President Sharad Pawar and former Lok Sabha Speaker P.A. Sangma have been in very close touch with Mr Vajpayee, sources pointed out, adding that the two would be more than willing to join the government. The coming in of the NCP at the Centre and the formation of a BJP-NCP government in Manipur would also save the ruling party from embarrassment in case of an electoral defeat in Uttar Pradesh, Uttaranchal and Punjab. The efforts of the lesser-known parties to put up a strong fight before the ruling BJP and the main Opposition Congress in the first elections to the state Legislative Assembly in Uttaranchal scheduled for February 14, this year have for the time being failed to deliver. The CPI, Uttarakhand Kranti Dal (UKD), Uttarakhand Janwadi Party (UJP) and the Uttarakhand Jan Vikas Party (UJVP) had earlier formally agreed to put a joint front but the UKD today released a list of 36 candidates in a total of 70 Assembly seats. On the other hand, Mr Munna Singh Chauhan, President of the UJP is demanding 50 seats for his party. However, he did not deny that a rift has emerged among the alliance partners but strongly opposed the UKD’s move of releasing a list of 36 candidates unilaterally. “A meeting of these parties is scheduled for tomorrow and the matter would be taken up for discussion”, he added. Even parties like the CPI and the CPM have chosen to drift apart in the run-up to the first Assembly elections. The CPM has chosen to join hands with the Samajwadi Party in a bid to strengthen the Lok Morcha formed at the national level. The move by the two Communist parties has also put a big question mark over the formation of a third front in the state. With the BSP against any tie up with other parties, it is quite apparent that the chances of forming a third front in the state are diminishing. “The UKD had spearheaded the Uttarakhand statehood movement. We want to contest from nearly 50 seats. Otherwise we will go alone,” said Mr Diwakar Bhatt, President of the UKD. The other recipients of the awards, instituted by the Rampur-based Maulana Mohammad Ali Jauhar Academy, are Sadhna Upadhyaya (advocate, Allahabad) and Mr Shariful Hasan Naqvi, former secretary of the Delhi Urdu Academy.